While I wouldn’t put ENTER THE DRAGON on the list of movies I’m embarrassed to have not seen, I will say that it’s sort of a shame that I’ve never seen a Bruce Lee movie in its entirety. I’ve never been a fan of the martial arts genre, its peak hitting in the 1970s and long a parody by the time I would have been interested. Certainly, the genre has its place, as Bruce Lee has his place, in the annals of film history. ENTER THE DRAGON was Bruce Lee’s last real movie before his untimely death, and it is widely considered to be his best. I watched ENTER THE DRAGON (1973) on 7.30.12. It was my first viewing of the film. I stumbled upon a high definition transfer of this film, and was excited to give it a go. The transfer is sparkling; it looks exquisite. If not for the bright primary colors and the disco heavy soundtrack, one might think this was not a film nearly forty years old. The sound mix is another story, but I’ll rip that apart in the bonus section. I have to say that my expectations were way too high going into this. I long heard this to be a masterpiece, and was disappointed to find a rather pedestrian action flick. While Bruce Lee’s fight choreography is very solid, the shooting of it by Director Robert Clouse and Director of Photography Gil Hubbs show the action sequences little reverence. Lee’s choreography can only be as good as the angle from which it is shot. A shot which masks the fact that no contact is made is ideal, and provides the illusion that some violence has just taken place. When we can see the lack of contact, it ruins the effect. Sometimes the action is shot well, sometimes not. But there seems to be no care taken in getting it right. The campy sound effects don’t help much, though I understand the tropes within the genre which led to this sort of silliness. The story doesn’t make much sense. Bruce Lee is really stretching as an actor as he plays, well, a guy named Bruce Lee. He’s sent to a secretive island where a martial arts tournament is being hosted by a corrupted former member of his Order, the Shaolin monks. Some other guys are drafted to fight as well, namely Williams (Jim Kelly) and Roper (John Saxon). What starts out as a nice little tournament soon falls apart, as the bad guy Han (Kien Shih) gets nervous about his invitees sniffing around the island too much. The whole thing devolves into a fight with Roper and Lee taking on hundreds of generic martial artists in a giant brawl. The idea of the tournament just disappears. I wouldn’t rip someone for loving this movie. Films with much less value have found their way into my heart. But coming at this now, having seen so many action films, I just find the entire thing to be bland. I give credit to some of the establishing shots, and to some of the long-range cinematography. I enjoyed some of the battles, particularly the famous fight in the Hall of Mirrors at the film’s climax. I absolutely appreciate the charisma and power of Bruce Lee. I just couldn’t fall for this movie. Too many silly zooms. Too much overstated dialogue (says Williams as he peruses a poor town: “Ghettos are the same all over the world. They stink!). Too little unpredictability. I just wanted something amazing to happen, and the Hall of Mirrors is the first time it got there. A big issue is made of Lee’s sister, and he avenges her ten minutes later. A big deal is made of Han’s daughters being his protectors, only they never show up again because the film doesn’t want to get into what a man does when confronted by a dangerous woman. There is just so little to work with here. Maybe I’m missing the point of all this. Maybe I like my mindless action to be bigger and more flashy. Maybe there is some deeper meaning with ENTER THE DRAGON which everyone else appreciates, but just doesn’t land with me. I wish I knew! Instead, I’m left wondering what I don’t get. 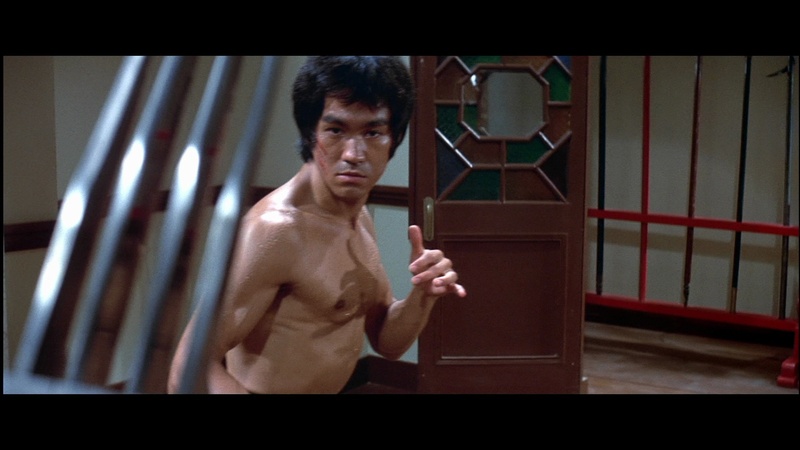 I leave ENTER THE DRAGON with plenty of respect for Bruce Lee’s craft, but surprisingly little for the movie itself. The negative bonus is for the abysmal film dubbing. I can forgive a foreign film dubbed poorly in English. But this entire thing was filmed with people speaking English, but no sound. Everyone went back and tried to match their voices to the mouths, with some actors being replaced by other voice actors. The result is a mess, particularly when watched with crisp video. The sound effects in this film are laughably bad as well. ~ by johnlink00 on July 31, 2012.